Road to Seattle: Senior women’s volleyball players Deja McClendon, Katie Slay, and Ariel Scott began their Penn State careers with a national title—they were freshmen when the Nittany Lions won the last of their four consecutive national titles in 2010. They’re hoping to end their careers in the same way. The Nittany Lions open NCAA tournament play in Rec Hall at 7:30 p.m. tonight against LIU-Brooklyn. The winner of that game will face Yale or Utah, which play tonight at 5, on Saturday. The Nittany Lions are seeded No. 2 overall, and they’re a blast to watch. 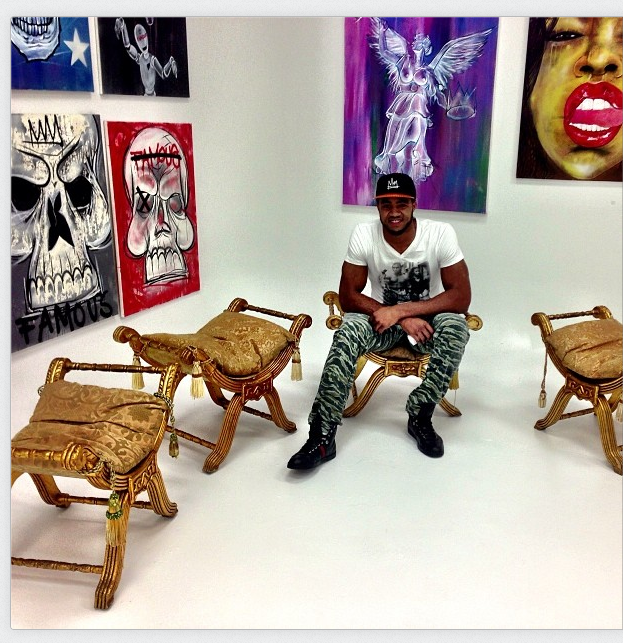 Aaron Maybin linked this Intagram photo of his Art Basel exhibit on his Twitter account, @AaronMMaybin. Art and football: What is it with Penn State football players and the art world? Former defensive end Matthew Rice is making a name for himself as a mural painter, and now here’s former defensive end Aaron Maybin, whose NFL career never really took off after he left Penn State early in 2009 with an exhibition at Art Basel, a big-deal festival in Miami that’s going on right now. In this video, Maybin discusses the relationship between football and art, saying he gets the “same joy” creating art as he gets from athletic competition, that he believes an artist is “the truest version of a storyteller that still exists,” and that he’s ready to paint when “I’m tormented by an idea.” There’s some adult language, but it’s an interesting conversation. And you can check out some of his work here. Yoga with Doug: I love that Onward State decided to write about Doug Hayward, teacher of the only Penn State fitness class that has a name attached to it—yes, Yoga With Doug, which is not to be confused with any other yoga classes around here. I was lucky enough to take an on-campus class from Doug a couple of summers ago, and it is truly an experience. I spent half the time in awe of the way he contorted his body (and he didn’t need a mat!) and the other half learning that my body was capable of way more than I’d realized. If you’re in town, you can always check out the offerings at his State College studio, too. A Penn State spokesman said pyrotechnics would not likely be used. The wrestling team is warming up for that spotlight match in an awesome way—competing tonight at Boston University, which is dropping its team at the end of this season. When Sanderson, who’s been an ambassador and advocate for the sport asked the BU coach if there were anything to he could do to help, the coach asked if Penn State could come up and wrestle them. So Penn State is, and it’s hoping the attention will help to save the program. Entry filed under: Uncategorized. Tags: Aaron Maybin, Ariel Scott, Cael Sanderson, Deja McClendon, Katie Slay, Matthew Rice.